We never cease to be amazed at the wonderful ways our community gets behind us, and we’re sure you’ll agree these supporters deserve a special mention and a big thank you. It’s your wedding day and you’re looking radiant, celebrating together with loved ones. What could possibly make the day more memorable? For bride Jo, who recently married Tom Thorne at Sturtlebury Barn in Loddiswell, it was something very unusual – and messy! When the guests voted for which member of the wedding party should receive a cake in the face for St Luke’s, they chose Jo, who – despite looking beautiful in her special dress – sportingly took it not just on the chin but over her entire face! Jo said: “Tom and I wanted to do something to help St Luke’s because we have all had loved ones cared for by the amazing team. When you’re just hours away from jumping 15,000ft from a plane for charity, it’s usually a nail-biting time. For Bernadette Mullarkey though, damaging her nails was something she definitely wanted to avoid! 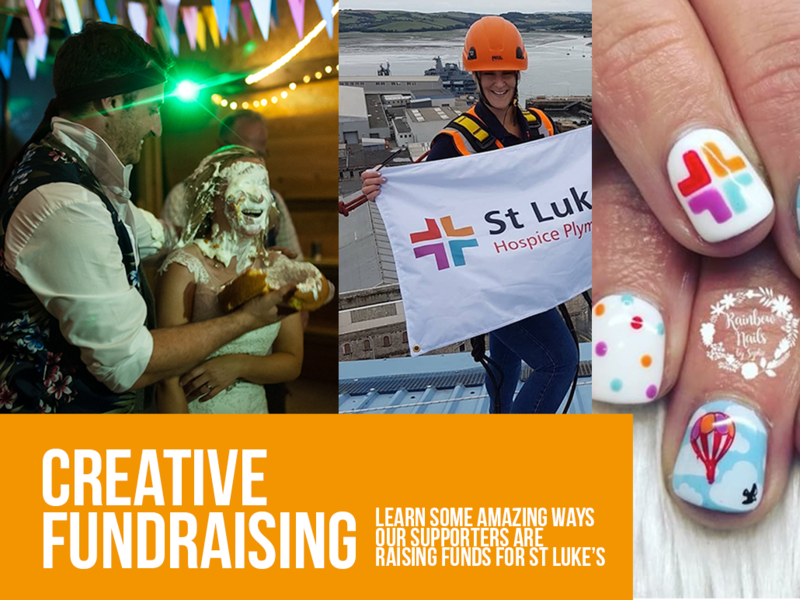 Plucky Bernadette, who was bravely taking part in a skydive for St Luke’s in memory of her dad, Rodney, got her nails done to mark the occasion and went all out with St Luke’s colours and logo on her fingertips, as you can see! With Plymouth Community Homes (PCH) getting behind us as their charity of the year, their fundraising has been reaching new heights! Recently, Housing Officer Paula Williams went above and beyond to bravely venture up on the roof of one of the landmark 43m-high Mount Wise Towers after she was ‘persuaded’ to take on the challenge, raising sponsorship money for St Luke’s in the process. It’s not every day a Housing Officer finds herself encountering the dizzy heights of being 17 floors up, so how did it come about? Once a month the roofs of all three towers undergo inspection to ensure they’re in good order. While this is normally carried out by specialists in building safety, Pete Bold from PCH’s Minor Works team invited Paula to don the harness and join in with an inspection as a highly original way to support St Luke’s. Paula, who used to work in community outreach, still remembers a local man she met while running a supper club for socially isolated older men and how wonderfully St Luke’s cared for him at the end of his life. When she visited Turnchapel for a tour, Paula told us: “I’m no fan of heights so when I came out of the tower’s roof hatch I was shaking. Wearing the safety harness and using ropes, I had to make my way all around the edge.